Before I get started with today’s post, I hope you’ll indulge me for just a moment to share a personal note with you. I want you all to know that I’m going to be absent from the blog for the next few weeks. Maybe you’ve noticed, maybe you haven’t, that since January this year I’ve posted only one recipe per week. That’s because of some back problems I’ve had that limit my ability to stand for any length of time. I’ve had back pain for the last 30 or so years, but I just dealt with it. However, last summer it got much more severe. And so, next Tuesday, June 2, I’ll have spinal fusion and decompression surgery to, hopefully, correct the problem. That means I’ll be off my feet for a while. In the meantime, some really great blogging friends will be helping me out. Thanks to the organizational efforts (and insistence) of Barbara from Creative Culinary, you’ll be enjoying guest posts from several fantastic bloggers all through the month of June. When you see them, please show your support by visiting their blogs and, if you’re so inclined, commenting and sharing their work. They (and I!) will appreciate it so much! See you back here in July! A couple of weeks ago, I bought a huge bag of perfectly ripe Roma tomatoes with the intention of making Pico de Gallo for guests. Well, even the best laid plans “gang aft a-gley” and I found myself in the next few days with dead ripe tomatoes about to go bad. I really hate that, don’t you? When I spend my hard earned money for beautiful produce, I want to enjoy it, darn it! So, instead of letting those tomatoes gradually reduce themselves to compost, I decided to rescue them for a later use. That’s where this recipe for Oven Roasted Tomatoes in Oil came into play. You may be asking what I’m going to do with these roasted tomatoes? Well, some ideas are using them in bruschetta (one slice on top of a crispy piece of baguette and goat cheese would be a delicious summer appetizer), combine them with hot, cooked pasta and fresh basil (yum! ), chop them and mix into an omelet (yes! ), and I could also envision a lovely pizza with these and some fresh mozzarella and basil. And don’t forget the oil! After it sits for a while with the tomatoes, it becomes infused with that gorgeous roasted tomato flavor and makes a luscious vinaigrette! Save this recipe/process/method/way-of-doing-something for the summer when you have more fresh tomatoes than you know how to handle. You’ll be happy you did! Preheat the oven to 325 degrees. Line a baking sheet with parchment (only if you’re lazy like me and don’t like to scrub pans). Slice the tomatoes 1/4 to 1/3 inch thick. If they’re really dead ripe, a serrated knife helps immensely with the slicing. 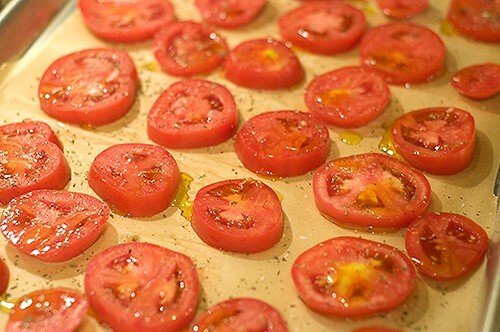 Place the tomato slices on the lined baking sheet. Sprinkle each lightly with salt and pepper and drizzle with olive oil. Sprinkle lightly with Italian seasoning. 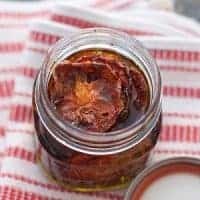 Remember that anything you put on the tomatoes is going intensify in flavor during the cooking process so use a light hand with the seasonings. Remove the tomatoes from the oven and let them cool. 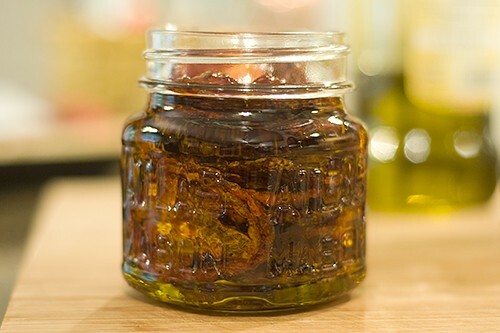 Pack the slices into a clean, dry jar and fill with a good quality extra virgin olive oil to cover. Store, tightly closed, in the refrigerator. I used five big Roma tomatoes and got a half-pint of roasted slices. Yeah. Don’t expect to be filling up quart jars full of these. They really cook down. But the flavor is so concentrated that a little goes a very long way! Use excess ripe tomatoes to make these delicious Oven Roasted Tomatoes. 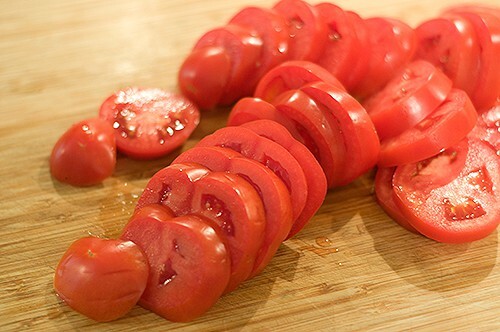 Store them in olive oil and use both the tomatoes and the flavorful oil. oes 1/4 to 1/3 inch thick. Place on prepared baking sheet. Sprinkle lightly with salt and pepper. Drizzle with olive oil. Sprinkle lightly with Italian seasoning. Bake, checking every 20-30 minutes, until tomatoes are roasted and beginning to show a bit of char around the edges. Remove from the oven and cool. Pack into a clean, dry jar. Fill with olive oil to cover. Store in refrigerator (not shelf stable). Thank you very much, Carol! I’m very optimistic about the surgery and really looking forward to being out of pain! I’m so sorry to read about your back – I hope things get better for you very soon! I love this idea for using up some tomatoes! Thanks for your good wishes, Ashley. And yes, this is a great way to use up extra tomatoes! I hope all goes well and a quick recovery. Wishing you all the best with your back surgery. I just know all will work out for you. Thanks so much, Wendy! I’m very optimistic about the outcome. Sorry about your back problems but I hope your procedure goes very well and you’ll be fully recovered when you return in July. The tomatoes looks delicious! Thanks so much, Brenda. Hope you’ll try the tomatoes. Wishing you a speedy recovery! 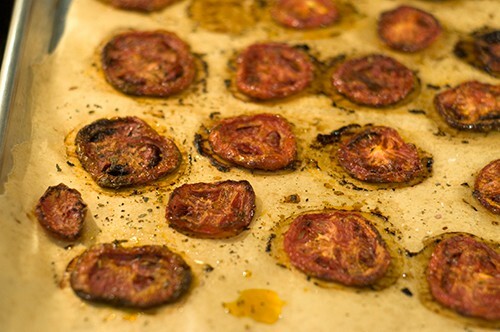 I can think of hundreds of different ways I’d eat these roasted tomatoes! Yes! So many ways to use these, Lauren. And thanks for the good wishes! Oooh, that’s no fun, but thank goodness for your wonderful friends minding the store. I’ll be thinking of you on the 2nd. Thanks for your good thoughts, Karen! And yes, thank goodness for great blogging friends! Wishing you much success and relief from the surgery. Praying for a smooth recovery! Wishing you all the best with your surgery – a neighbor of mine had similar surgery last summer and she feels so much better, she’s wishing she didn’t put it off for so long! These tomatoes look amazing – we do something similar with our garden (over) abundance every year! I’m sorry to hear about your back problems! I hope the procedure will give you some relieve… You’re ending May on a fabulous note, though – I love this recipe! It’s a great way to use these extra tomatoes from the garden. Yum! Hope you get to feeling better soon Lana! These oven roasted tomatoes look insane! They’re like candy for me. First, these look amazing! Second, a day late and a dollar short – just reading this, the day after your big day. I hope the surgery was a major success and you’re up and at em in no time, feeling way better than even before that first twinge all those years ago!